The 13 Best Places to Celebrate St. Patrick’s Day in Iowa! Whether your Irish heritage runs deep or you’d just like to celebrate along with them, don’t just sit on the couch this St. Patrick’s Day. Instead check out a nearby St. Patrick’s Day party or parade. If you are in the state of Iowa come March, you won’t have to travel far thanks to the different celebrations happening all over. Family-friendly parades, authentic Irish cuisine and perhaps a green beer or two, whatever your flavor of celebration is, you’re sure to find something to like at these 13 places to celebrate St. Patrick’s Day in Iowa. Spanning two miles, two states and thousands of participants, the Grand Parade hosted by the St. Patrick Society is not only one of the biggest St. Paddy's Day celebrations in Iowa, it's one of the biggest events in the nation. Beginning in Rock Island, Illinois, this parade takes off and crosses the Mississippi River via the Centennial Bridge to end in Davenport where the festivities continue throughout the day. Thousands upon thousands of spectators will be witnessing this event, and for a family-friendly good time, it's worth checking out The Grand Parade yourself. For over 35 years the Gaelic Gallop St. Patrick’s Day Race, presented by Total Fitness, has been providing a healthy way to celebrate St. Patty’s Day throughout the streets of Dyersville. Featuring either an 8K or two-mile race to compete in, this family-friendly event draws quite the crowd, which is the perfect way to work off some of that corn beef and cabbage you might be inclined to eat come St. Patrick’s Day. If green beer is more your flavor come St. Patrick’s Day, then no party outdoes the celebration at Mickey’s Irish Pub. This pub does it right by hosting this exuberant St. Paddy’s Day festival. Featuring live music, plenty of good cheer and enough people to fill the streets of downtown Des Moines, if you are looking for a good spot to celebrate St. Patrick’s Day this year, look no further than Mickey’s Irish Pub & Grub. The St. Patrick’s Day Parade Society of Cedar Rapids is more than just a mouthful, it’s a non-profit, volunteer-run organization that puts on one of the best St. Patrick’s Day parades in the state. With attendance well into the tens of thousands, be sure to line up on the streets of Cedar Rapids early for this festive event, and don’t forget to cast your vote for this year’s Irish Colleen, the Irish equivalent of homecoming queen, chosen each year from a large pool or Irish-descendant candidates. Touted as the Cedar Valley’s Authentic Irish Pub, the Jameson’s Public House in Waterloo is your one-stop shop for Irish food, drink and culture. While the Gaelic script written on the walls and the extensive list of Irish whiskeys on the menu are appealing year-round for any Irish enthusiasts to enjoy, the real celebration kicks off on St. Patrick’s Day each year with day-long festivities and specials to really enjoy the holiday. For a true touch of the Irish spirit this St. Patrick’s Day, head on down to Emmetsburg for not only their worlds-famous parade, but also the culture that’s brimming from the streets of the small Iowa town throughout the entire week. Featuring a Miss Shamrock Pageant, an Irish Potato Bar and even a talent show, Emmetsburg really comes to life with its Irish ancestry for their week-long festivities celebrating the patron saint of Ireland. For a delicious, Irish-authentic meal this St. Patrick’s Day be sure to head on down to Prairie Meadows Racetrack and Casino for their state-famous Triple Crown Buffet. Featuring Irish favorites like corned beef brisket, baked cabbage and onion soup, you can top off your meal with a Guinness if you’d like, but if one thing is guaranteed at the Triple Crown Buffet is that you won’t leave your seat unsatisfied with the Irish food selection. Located on the outskirts of the Iowa State University Campus, Dublin Bay Irish Pub & Grill is often packed with students and Ames residents alike anytime of the year, but come St. Patrick’s Day you can expect a line out the door. Featuring an authentic Irish breakfast to start the day, followed by bagpipe players and Irish dancers throughout the afternoon, the party will hit its peak in the evening when Dublin Bay Irish Pub & Grill will come to life with masses of people enjoying the late-night St. Patrick’s Day festivities. For a family-friendly parade and following St. Patrick’s Day festivities, Elkader has spent the last 25 years building quite the reputation for an Irish-themed fun time. The parade begins in the late afternoon in downtown Elkader, and leads into an evening of family-fun concerts and sing-alongs at Johnson’s Reception Hall on High Street. Whether you have a bit of Irish descent in you or not, the St. Patrick’s Day Parade and Celebration in Elkader is a great spot to spectate and engage with a friendly community. Featuring a large and lively patio, even if the weather isn’t right for outdoor seating, Founder’s Irish Pub in Bondurant is guaranteed to be a lively place this St. Patrick’s Day. 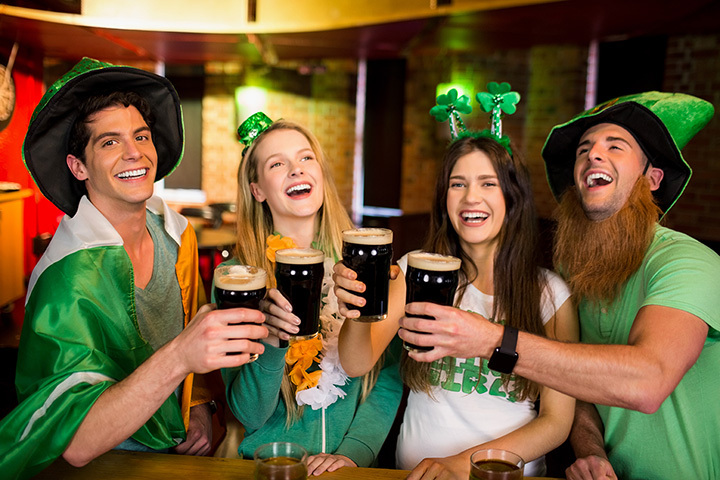 Featuring a full menu of Irish and American cuisine, including an ample selection of Irish authentic and Irish-inspired libations, anytime of the year is a fun time to visit Founder’s Irish Pub, and come St. Patrick’s Day this will be one pub that is packed full of lively entertainment. If you happen to be on the Western edge of Iowa this St. Patrick’s Day, then the Sioux City St. Patrick’s Day Parade is your best bet for something fun to do for the whole family. Featuring floats, live music and plenty of treats for younger spectators on the streets, the Sioux City St. Patrick’s Day Parade is not the biggest parade in the state, but alongside the community of Sioux City, it doesn’t disappoint in terms of good old fashioned family fun. While an entry into the We Run Lucky Run 10K gets you a chance to win some fantastic door prizes, anyone who runs this Irish-inspired race can be considered a winner after crossing the finish line. Family friendly and green clothing recommended, the We Run Lucky Run can be a healthy alternative, or at least healthy start to your St. Patrick’s Day celebrations, and with all proceeds going toward charitable causes, there are truly a lot of winners involved with this annual lucky run. Providing green beer all day long on St. Patrick's Day, plus Guinness that's always on tap, it's easy to wash down all the corn beef and cabbage to be found at Stout's Irish Pub in Clinton. Featuring Irish music playing all day, Stout's is already the No. 1 Irish Pub in Clinton and the surrounding county throughout the year. Head on over to Stout's yourself to see what all the fun is about.